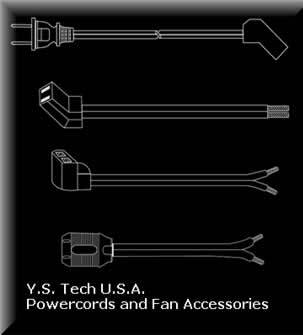 YS Tech USA offers a full line of fan accessories, from AC power cords to fan guards and more. Whatever your application may be, we have the right accessories for your fan. 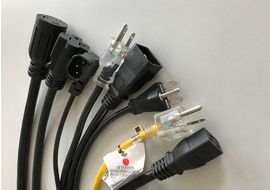 We offer power cords for our AC fans and essentially any other AC-powered electrical product. We offer NEMA-rated (National Electrical Manufacturers Association) plugs from 15-60A, all types of service jackets, and international plug types. View NEMA cord configuration specs to find the right plug/receptacle option for your needs. From standard cords to completely custom solutions, we supply reliable AC power cords for all applications. YS Tech USA’s push on fan guards and aluminum fan guards are designed to improve airflow by keeping debris out of the fan. Our fan guards help extend the working life of your fan and its moving parts in demanding applications. A range of fan grid styles are available, with sizes ranging from 25mm to 254mm. Our power cords, fan guards, and other accessories help users get the best performance out of their fans. They are effective in a wide range of applications, including telecommunications, energy production, and more, as well as in challenging work environments. YS Tech USA offers a full line of fan power cords, fan guards, and more, to meet the needs of any thermal management application. Contact us or find a distributor near you to place an order or to learn more about our fan accessories. We also offer DC fans, heatsinks, AC fans, DC brushless blowers, cross flow fans, and more.